Jay has been my barber for almost 10 years, he is simply the best. 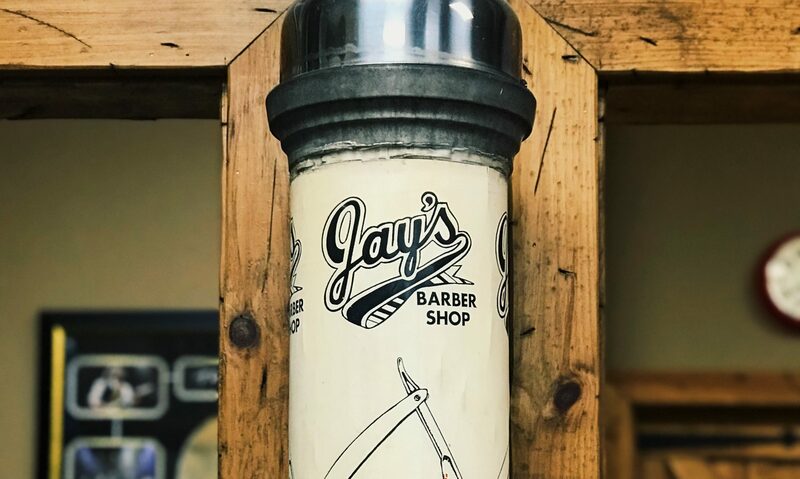 Jay is the barber you always wanted, he knows your name, your last big trouble, he never has to ask what cut you want because he always remembers. If you want to make an appointment and be in and out in between appointments he can do that, if you want a full cut, shave and style with some chat, he’s also your man. I have been getting my hair cut by Jay for close to eight years now. He was born to do this. From his attention to detail, to taking care of every single customer in a professional manner, Jay strives to be the best at his craft. He’s one to converse with his clients, no awkward silence while getting your hair cut. He has also been cutting my son’s hair since day one and is very gentle with kids/toddlers. I highly recommend him to anyone looking for a quality cut. Guys out there, you have to give Jay a call and go see him for a great haircut and fantastic conversation. Jay has been my Barber for 10 years, I think that pretty much sums up every quality you want in someone who you trust with your appearance. A barber makes you..YOU. For 10 years Jay has been consistent, precise and more importantly he has been exceptional. Although he makes it look easy; do not take what he does for granted. Ask any of his clients if they would go to anyone else and they will look at you like you have grown a second head. If you want a Barber who can give you the same cut every time you come in or if you want to change up your look on a moments notice, Jay can and will take care of you. Jason has been my barber through 3 jobs, 5 homes and more relationships than I care to count. Not only do you get a great haircut but also a fantastic conversation. Now he has his own shop. It is one of my favorite places to be. Jays been cutting my hair for almost 6 years now. Unbelievable service and someone who truly takes pride in their art/work. No one else I trust to touch my hair, I’ve never left with something less than stellar. Jay is a stand-up guy with the talent to back it up! I would not consider having any other barber on the planet. He is quick, clean and flawless. Not to mention his customer service far surpasses any experience I have had to date. This man has mastered his trade. Cheers. All I can say is that while I was living in Thunder Bay, I would fly home every 3 months or so and have Jason cut my hair. Been going 6 years or so now as my barber. Jason is amazing with kids and is so patient. I have been taking my son to have his hair cut by Jason for two years and wouldn’t dream about taking him anywhere else!!!!!! This dude is the man. As a professional, he gives you the one on one barber client experience that is lost in today’s world. This isn’t just a job for him, and it really comes through in his work. Jason has been my barber for years now. If you want a consistent cut, attention to detail and excellent conversation, this is the place to go. I’m definitely excited that he’s got his own shop and I look forward to seeing it thrive. Jason always gives me awesome haircuts, never any complaints. Can’t wait to see the shop when the renovations are done! !